Dredge the fish fillets in the flour. Heat 2-3 tablespoons oil in a large frying pan. When hot, add the fish, skin-side down and fry for 4 minutes. Carefully turn and fry for another 3-4 minutes until just done. Keep the fish warm. Heat 2 tablespoons of oil in a large frying pan over a medium heat. Add the onions and fry until fragrant. Add the chillies and stir fry for about 2 minutes. Remove about a third of this mix and reserve for a garnish. Add the soy sauce, water and sugar to the onions and chillies in the pan, and simmer gently until the onions are soft and the sauce is thick. Add the lemon juice. Do not boil as the lemon juice will lose its fresh flavour. 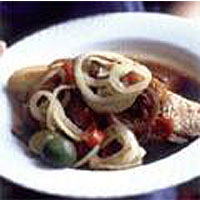 Pour the sauce over the fish and garnish with the onions and chillies. Serve with rice.